As I first saw the level 100 talents for shaman on Wowhead, it didn't take long 'till I had found my favorite. Yep. 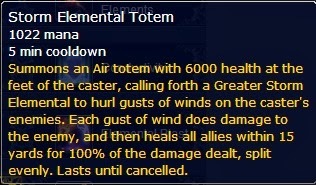 Storm Elemental Totem definitely sounds like the best choice for raiding, particularly when we're talking about single-target oriented fights. It also sounds like the best one for Brawler's Guild style soloing - and I do hope we get new Brawler's bosses for level 100, since that was definitely one of my favorite features in Mists of Pandaria. And of course I'll welcome any new elemental companion. What will this one be called, air or storm idiot? Gusting idiot? I do wonder, though, if it will either replace one of the existing elementals, or if it can be summoned simultaneously with either of the two. At the moment I don't play enhancement on any shaman of mine, but I don't get the "I'm definitely not going to get that one" feeling from any of the talents considering that specialization. I have to say that none of the talents sound particularly exciting for restoration, at least from my point of view. So far it looks like I'll be going for either Storm Elemental Totem or Rainstorm on my resto shaman Damjan, who I've really enjoyed later in Mists of Pandaria. 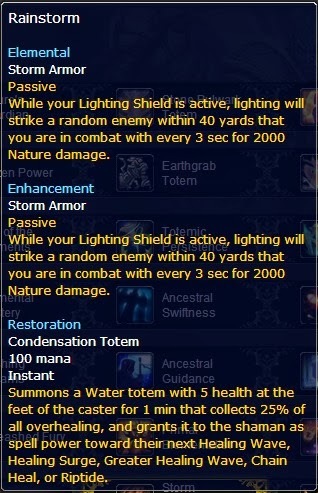 For elemental, Rainstorm sounds like the average passive talent. Very simple, no need to worry about it or think about it. One that I might consider going for if I was new to the class, or if I didn't play it as main. 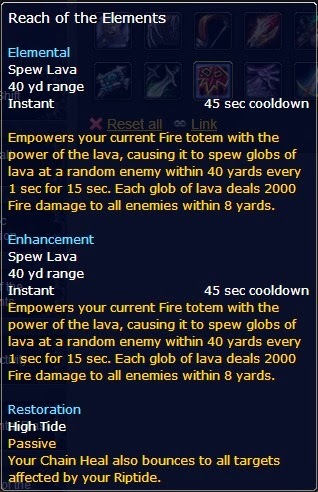 If Reach of the Elements was passive for elemental, I would probably go for it in most situations, even if they nerfed its AoE effect. Exceptions would be those where I need extra burst and the Storm Elemental would come in handy. With my current talents I've tried to maximize sustained DPS over burst, which is a decision I've been rather happy with. I'd like to continue doing so with a passive talent like this one. Naturally some, or all of the talents will be changed somehow before they go live. For now, you can view all the current talents here. If we leave the shaman subject for a moment, some talents for other classes that I really like include Defile for death knights, With or Without You for hunters and Death from Above for rogues.